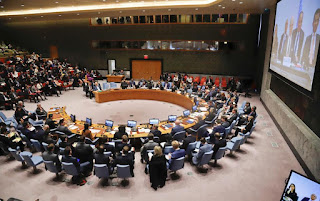 The United Nations Security Council meet and hear remarks from U.N. Special Envoy to Syria Staffan de Mistura via video broadcast, Monday April 9, 2018 at U.N. headquarters. BEIRUT (AP) — The Latest on the developments in Syria (all times local): 11:20 p.m. The U.N. Security Council has rejected a Russian resolution that would have created a new expert body to determine responsibility for chemical weapons attacks in Syria. The resolution needed at least nine "yes" votes in the 15-member council for approval, but only six countries voted in favor. Seven council members, including the U.S., Britain and France, voted against the proposal and two abstained. U.S. Ambassador Nikki Haley said the draft resolution was not impartial or independent since it would allow Russia to veto investigators and staff for the new body — and to block its findings. She accused Russia, a close ally of the Syrian government, of repeatedly shielding President Bashar Assad instead of working for Security Council unity. Russia has vetoed a U.S.-drafted U.N. resolution that would have condemned last weekend's suspected gas attack near Damascus and established a new body to determine responsibility for Syrian chemical weapons attacks. Russia's envoy to the European Union says Moscow has warned the U.S. against striking Syria. Vladimir Chizhov told Euronews on Tuesday that "Russia has warned U.S. representatives, publicly as well as through proper channels, over the grave consequences that could arise if these strikes happen and whether deliberately or otherwise Russian citizens are hurt." Chizhov's comment follows an earlier statement by the chief of the Russian military's General Staff, Gen. Valery Gerasimov, who warned that Russia will fire back if the U.S. attacks Syrian government facilities. Gerasimov noted last month that Russian military officers are present at Syrian facilities and warned that "if a threat to our servicemen emerges, the Russian armed forces will take retaliatory measures against both missiles and their carriers." U.S. President Donald Trump threatened military action after last weekend's suspected chemical attack on a rebel-held town near Damascus, which activists and rescuers say killed at least 40 people. The Syrian government and its ally Russia have denied carrying out any such attack. Gorbachev expressed "great concern" on Tuesday over the mounting tensions over Syria and emphasized the need for the U.S. and Russia to prevent incidents between their military forces in the region. He said he is confident that "no one wants a war," but added that "such incidents could result in a huge disaster in the current tense environment." Gorbachev, speaking to the Interfax news agency, said it's essential for U.S. President Donald Trump and Russian President Vladimir Putin to meet to defuse tensions. He added that he is "deeply disappointed with the way current leaders are doing business," pointing at their "inability to engage in a dialogue and use diplomatic mechanisms." Macron said Tuesday he wants a "strong and joint response" to the attack in the Syrian town of Douma on Saturday, which Syrian activists and rescuers say killed 40 people. The U.S. and its allies accuse the Syrian government, which denies responsibility. Asked whether France would take military action in response to the Douma attack, Macron said France will continue discussing technical and strategic information with U.S. and British allies and "in the coming days we will announce our decision." He said any action would "target chemical weapons" stocks. Macron reiterated that the use of chemical weapons in Syria is a "red line" for France. Saudi Arabia's foreign minister says those responsible for a suspected chemical weapons attack in Syria must be "held accountable." Speaking on Tuesday to reporters in Paris, Al-Jubeir said Saudi Arabia is "greatly concerned" about the attack Saturday in Douma, adding, "we are discussing with our allies the steps to respond." The U.S. and allies have accused Syrian President Bashar Assad's government of the attack, which killed 40 people. Syria's government denies responsibility. The Saudi minister did not insist on Assad's departure as the U.S. and allies have done in the past, saying instead that "Syrians must decide" his future. Prime Minister Theresa May's office says the leaders of Britain, France and the United States are determined that those behind a chemical weapons attack in Syria will be "held to account." May's office says the prime minister spoke by phone Tuesday with U.S. President Donald Trump and French President Emmanuel Macron. Downing Street called the reported attack "utterly reprehensible" and said "the international community needed to respond to uphold the worldwide prohibition on the use of chemical weapons." The U.S. draft resolution would condemn the continuing use of chemical weapons in Syria "in the strongest terms" and establish a new body to determine responsibility for chemical attacks. Russia's U.N. Ambassador Vassily Nebenzia said Monday "it contains some unacceptable elements," signaling a Russian veto. Russia's rival resolution for a new body to determine responsibility for chemical attacks in Syria was rejected by Western nations when it was first circulated in January because it would require the Security Council "to thoroughly assess" the investigators' findings, which would effectively give Russia a veto. President Donald Trump has spoken with British Prime Minister Theresa May as speculation mounts of a potential U.S. response to Syria's apparent use of chemical weapons on civilians over the weekend. That's according to the White House, which says the two leaders condemned Syrian President Assad's "vicious disregard for human life." The White House says the two leaders on Tuesday "agreed not to allow the use of chemical weapons to continue." French Prime Minister Edouard Philippe says atrocities in Syria must be met with a "strong, united and determined response" from the international community. Philippe spoke Tuesday in France's lower house of parliament about Saturday night's apparent chemical attack in the rebel bastion of Douma. He says: "The regime's allies have a strong responsibility in this massacre." He said international law has been violated "one more time" in Syria. Philippe didn't mention the possibility of military intervention in the country. French President Emmanuel Macron and U.S. President Donald Trump have talked twice in two days to discuss Syria's issues. 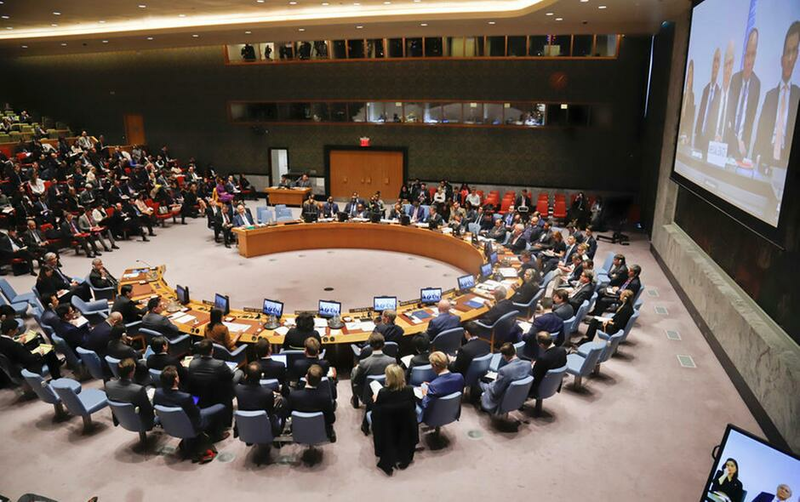 U.N. Security Council diplomats say the United States has called for a vote on a resolution that would condemn the continuing use of chemical weapons in Syria "in the strongest terms" and establish a new body to determine responsibility for chemical attacks. Russia's U.N. Ambassador Vassily Nebenzia told reporters late Monday the U.S. draft resolution "contains some unacceptable elements which may make it even worse," a strong indication that a Russian veto is likely. Nebenzia said he may also call for a vote on the Russian text. The U.S. draft singles out last weekend's suspected poison gas attack in the rebel-held town of Douma in the Damascus suburbs. It expresses "outrage that individuals continue to be killed and injured by chemical weapons" in Syria and "determination that those responsible must be held accountable." Syria called on the OPCW on Tuesday to work with "full transparency and rely on credible and tangible evidence." A senior Russian lawmaker said earlier Tuesday that Moscow is willing to help arrange a visit. Asked in Berlin on Tuesday whether she supports the idea, Merkel replied that "the evidence that chemical weapons were used there is very, very clear." She added: "As far as I am concerned, that can be checked over again, but it doesn't help us as we condemn the case." Merkel said that "we must speak very, very clearly." Syrian opposition activists say 40 people died in Saturday's chemical attack in Douma. The opposition blamed President Bashar Assad's forces, accusations the government strongly denies. United Nations Secretary-General Antonio Guterres says he is outraged by Syria's apparent chemical weapons use against civilians. Opposition activists said 40 people died in Saturday night's apparent chemical attack in the town of Douma, the last remaining rebel bastion in the eastern suburbs of Damascus. Turkish President Recep Tayyip Erdogan says his country will hand over control of the strategic town of Afrin — which Turkish troops seized from Syrian Kurdish forces last month — to the people of Afrin "when the time is right." His comments, reported by the state-run Anadolu Agency on Tuesday, were in response to Russia's Foreign Minister Sergey Lavrov who said Monday that Russia expects Turkey to bring Afrin under the control of the Syrian government. Erdogan was quoted as saying: "We will determine the time. That is up to us, not to Mr. Lavrov." In an address to party legislators earlier, Erdogan again condemned the weekend's suspected poison gas attack in Syria and called for the perpetrators to "pay a heavy price for it." Erdogan said he would continue to hold discussions with Russia's president Vladimir Putin over the suspected chemical attack. The foreign ministers of Germany and Sweden are calling on Russia to use its influence in Syria to pressure President Bashar Assad's government to give up its chemical weapons in the wake of a suspected poison gas attack. Swedish Foreign Minister Margot Wallstrom dismissed the idea of military retaliation Tuesday, saying "it's the role of the Security Council first of all to advocate a non-violent resolution to this" to avoid escalation. Calling the attack a "horrible crime," German Foreign Minister Heiko Maas said Russia and others needed to ensure Assad gives up chemical weapons and opens humanitarian air corridors. Wallstrom added "these are civilians who have once more been attacked and killed in this way — this is simply unacceptable and we need to keep up the pressure on Russia." A senior Iranian official says Israel's airstrike on a Syrian air base that killed seven Iranians "will not go unanswered." Ali Akbar Velayati, an aide to Iran's supreme leader, made his comments upon arrival in the Syrian capital on Tuesday. Velayati was quoted by the country's state-run news agency IRNA. Russia, Iran and Syria have blamed Israel for Monday's attack on the T4 air base in the central province of Homs that a Syria war monitor said killed 14 people, including Iranians. Iran's semi-official Tasnim news agency puts the number of Iranians killed in a missile attack on a Syrian air base at seven. Israel's official Holocaust memorial says that Syria's latest suspected chemical weapons attack shows that international organizations set up after the Holocaust have failed in their job. Yad Vashem Chairman Avner Shalev says Tuesday that the images of citizens, including children, being massacred just beyond Israel's border reveal crimes against humanity that the world must step in to stop. He said they were allowed to take place because of the "world's indifference." He called on international bodies to act decisively to end the suffering. Syrian opposition activists say 40 people died in Saturday night's poison gas attack in the town of Douma, the last remaining rebel bastion near Damascus. The Tuesday report said bodies of victims have been transferred to Tehran. It said funerals will be held in the victims' cities of origin across the country. Two of them, Hamed Rezai and Hojjatollah Nochamani, are from Tehran. The report did not provide the victims' military rank or further information. Israel is strongly condemning the Syrian government's suspected chemical weapons attack on its own citizens. Israel's foreign ministry says Tuesday that Syria "continues to perpetrate crimes against humanity in using these outlawed weapons." Israel says the attack "joins a long series of similar attacks using chemical weapons" by the Assad regime after it undertook to disarm from such weapons. A top Russian diplomat says the Israeli ambassador in Moscow has been "invited" to the Foreign Ministry to discuss developments in Syria following an airstrike that both Moscow and Damascus have blamed on Israel. The Russian military said the Israeli Air Force launched Monday's airstrike on a military air base in central Syria that reportedly killed at least 14 people, including Iranians active in Syria. Mikhail Bogdanov, Russian presidential envoy for the Middle East and Africa, told Russian news agencies on Tuesday that the Israeli ambassador to Moscow was asked to come to the Foreign Ministry "to talk" later in the day. The measures come as President Donald Trump is threatening an imminent military strike against Syria, vowing to respond "forcefully" to Saturday's apparent chemical weapons attack on civilians and warning that Russia or any other nation found to share responsibility will "pay a price." The Sound and Picture Organization, an activist collective in eastern Syria, said on Tuesday that Iranian fighters and members of Lebanon's Hezbollah group have evacuated their positions in the Boukamal area, near Iraq's border. Syrian opposition activists say 40 people died in Saturday night's chemical attack in the town of Douma, the last remaining rebel bastion near Damascus. The opposition blamed President Bashar Assad's forces for the attack, accusations the government strongly denies. Yevgeny Serberennikov, from the defense committee at the Federation Council, told the RIA Novosti news agency on Tuesday that Russia is anxious for the Organization for the Prohibition of Chemical Weapons to "finally start carrying out the functions it was created for."